It “adds a piece of art and functionality for your backyard,” says the sales page of the Belleze outdoor heater. It’s silver, stands 65 inches, and boasts a stainless steel frame that’s sure to last a long time with proper care. Above all, it has a quartz tube in the center where flames dance through. It sure makes a great spectacle when lounging outdoors on a cold night. – Pyramid and Round Cubic Design. One of the unique features of the Belleze outdoor heater is its so-called “pyramid and round cubic” design. True, it’s unlike other brands such as the Thermo Tiki. What’s the advantage? As advertised, it “spreads a diamond pattern of warm fire light” and distributes it across your entire balcony. Aside from this, expect a heavy-duty, stainless steel construction. – 34,000 BTUs. This outdoor heater is powered by propane, and it produces a total of 34,000 BTUs of heat output. For comparison, one stove burner has a max output of 11,000 BTUs, depending on the brand. If you’re feeling too hot, you can always control the output through a knob. Simply twist it. Let’s not forget to say that beside this knob is an electronic striker switch ignition. – Quartz Tube. At the center of this patio heater is a quartz tube where the flames come out. Expect dancing flames, which should be a nice sight as you spend quality time with your family outdoors. – 2 Lbs. Per Hour. As advertised, the Belleze outdoor heater consumes propane (or butane) at a rate of up to 2 lbs. per hour. – Wheels. This heater can be easily moved from one place to another. It has two wheels on one side so you can tip it and roll. – Noise. 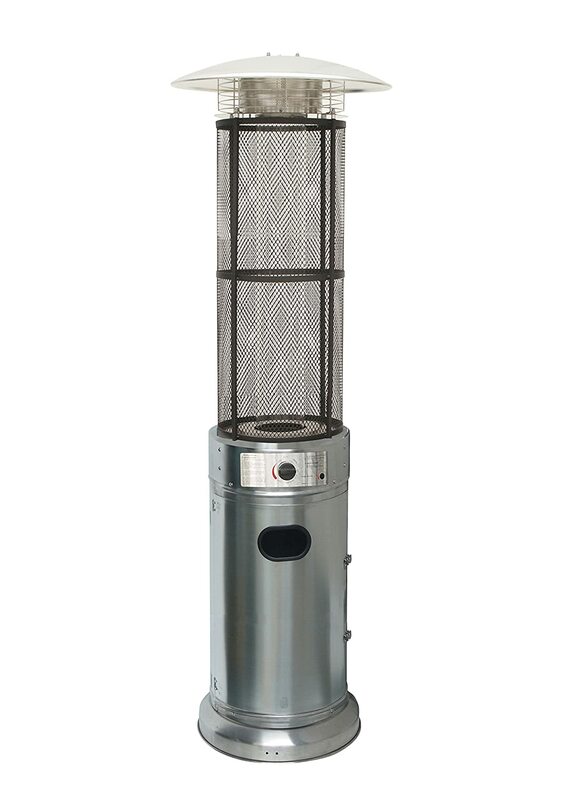 In case you’re wondering whether this outdoor heater from Belleze produces much noise or sound, the only sound you can expect is a hissing sound from the gas. That said, it shouldn’t be too bothersome to even disrupt a nice conversation with a friend. – Assembly. Yes, this unit requires some assembly, but according to general feedback, it should be easy to put together. One person who says is “not a handyman by any definition” was surprised that he was able to set it up in 1.5 hours. – Heat Output. It certainly isn’t the most powerful as far as heat output is concerned. For instance, the Dyna-Glo DGPH201BR puts out up to 48,000 BTUs. But this patio heater does the job fairly well, especially if you have a relatively small patio. Apparently, performance is affected by the breeze. One person has observed that with a cool breeze, you’ll have to be within 2 feet to feel the heat. This patio heater from Belleze is ideal for small patios. If you have a larger one, it’s best to consider other brands that has better heat output. An example is the Dyna-Glo DGPH201BR.